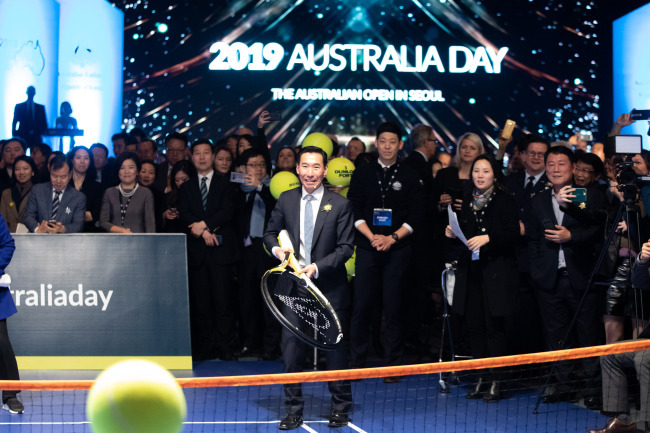 Over 1,500 people gathered in Seoul on Jan. 25 to celebrate Australia’s national day with an event hosted by the Australian Embassy in South Korea with a theme in recognition of the Australian Open. The annual tennis tournament inspired fans here and abroad alike last year with the memorable sporting achievement made by Korean semifinalist Cheong Hyun. The embassy’s event, which was held at the Grand Hyatt Seoul, was designed to “reflect Australia’s core values of inclusiveness and diversity,” it said. “Australia remains a close and long-standing friend of Korea. Our bilateral relationship is strong, based on our extensive economic and political ties and deep people-to-people links,” James Choi, the Australian ambassador to South Korea, said while delivering his opening remarks. Distinguished guests included Korea’s Gender Equality and Family Minister Jin Sun-mee, Macquarie Capital Korea Chairman John Walker and the newly appointed goodwill ambassadors actress Park Ha-sun and her husband, actor Ryu Su-young. During the official 2019 Australian Day event, the embassy livestreamed the Australian Open semifinals followed by a video message from Cheong. The annual Australia Day on Jan. 26 commemorates the arrival of the first British settlers in 1788.